"BRIGHT BURNING STARS is surprisingly dark and twisty, following two young ballet dancers in their final year at Nanterre in..."
"Bean and Tai are neighbors in a low-income housing project and have been friends for a very long time, but..."
"What do the animals at the zoo do at night when nobody's around? They dance at the Zoogie Boogie Fever!..." "Maya and the coding club are going to be working on a new and innovative idea for incorporating technology into..."
"Young Misty loved to sing and dance, and started studying gymnastic at the age of seven, after seeing a movie..."
"Swan Boy by Nikki Sheehan made me incredibly angry. When the lead character, Johnny, moves with his family, he is..."
"Barbara McClintock tells the beautiful story of two ballerinas from different worlds, but with a shared love of the stage...."
"What I Loved: I was very excited about THE SMELL OF OTHER PEOPLE’S HOUSES when I first read the..."
"TAKING FLIGHT is both potent and potentially worldview-expanding. 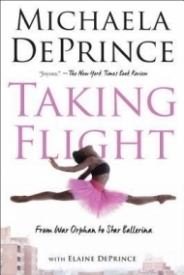 Whether you’re interested in ballet or not, this YA memoir is a..."
"Mr. Hare is hungry, and he is sitting under a cherry tree full of ripe fruit, but he has a..."
"This book is a delightfully breezy story, light but not exactly “fluffy”—the kind of book that gives you a satisfied..."